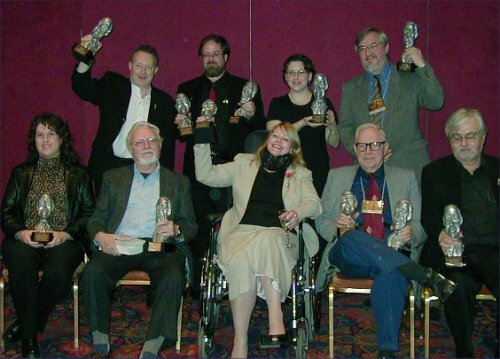 § The World Fantasy Awards winners were announced Sunday, November 3, 2002, at the World Fantasy Convention 2002 in Minneapolis. Judges for this year's awards were Peter Adkins, Meg Davis, Jason Van Hollander, Michele Sagara West, and F. Paul Wilson. Complete nominees were listed here. Next year's convention will be Washington, DC. The convention in 2004 will take place in Tempe, Arizona, and the 2005 convention in Madison, Wisconsin. Ursula K. Le Guin, Stephen Jones, and Dennis Etchison have two previous World Fantasy Awards each; Le Guin's includes a Lifetime Achievement Award in 1995. George Scithers has one previous award, in the Special Award, Professional category. S.P. Somtow has been nominated 3 times before; Nalo Hopkinson, Jo Fletcher, and Raymond Russell & Rosalie Parker each have 1 previous nomination; and Albert Cowdrey and Allen Koszowski have never been nominated until this year. The complete list of previous World Fantasy Award results by nominee (not yet updated for 2002) is posted here. SF author and physicist Charles Sheffield, born 1935, died this morning of brain cancer. He was diagnosed with a brain tumor in August, as Sheffield announced on his website. Sheffield's first published SF was short story "What Songs the Siren Sang" in 1977, and his first novel, Sight of Proteus, appeared in 1978; since then he published more than 100 stories and nearly 30 novels. He won the John W. Campbell Memorial Award for novel Brother to Dragons (1992), and won both the Hugo and Nebula awards for novelette "George on My Mind" (1993). Other notable works included The Web Between the Worlds (1979), concerning a "space elevator" coincidental with the same idea in Arthur C. Clarke's The Fountains of Paradise the same year; several volumes in the far future "Heritage Universe" sequence, Summertide (1990), Divergence (1991), Transcendence (1992), and Convergence (1997); and several volumes in Tor's multi-author "Jupiter" novels for young adults, including The Billion Dollar Boy (1997). He also published nonfiction The Borderland of Science in 1999 and two volumes of annotated satellite photos of Earth, Earthwatch (1981) and Man on Earth (1983). Three new books have appeared or are scheduled to appear this year from Baen Books: collection The Amazing Dr. Darwin in June (concerning Charles Darwin's grandfather); an expanded version of 1985 novel Between the Strokes of Night; and new "Heritage Universe" novel Resurgence. Sheffield is survived by his wife, SF writer Nancy Kress. A memorial service will be held Saturday, November 16, at the Collins Funeral Home at 500 University Blvd, West, Silver Spring, MD, at 1:00 p.m. Several memorials appear on the SFWA News page; others will appear with the complete obituary in Locus Magazine.